I've been going through the house getting things ready for our garage sale and came across several old photo albums that I forgot about. There were some pics from LCCC from way back when, like 1993. I guess we were both too shy to actually take that many pictures together, like as a "couple" cause we were only 12 years old cause I don't have very many of Gavan and I but someone took this one of us. We are sitting around the campfire singing devotional songs. Like I said the picture is from 1993 so the quality is poor and it was taken at night. 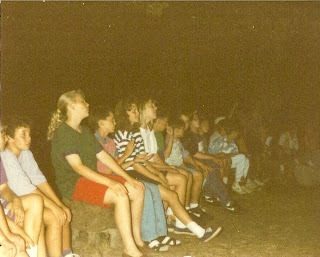 Several of you know several of us in the picture: Juli Barker (blonde in green shirt), Gavan, Me, Katie (Wise) Ross, Kale Dittmeyer and the rest you wouldn't know or can't really see. 1. All of us girls are MUCH bigger than the boys but I don't think we cared. 2. I love Gavan's white socks with his NIKE sandals.........don't lie, we all wore that style. 3. My bangs added about 3 inches to my height so I look taller than I really was. By the way, I sported those bangs for a couple years and worked really hard every morning on them! 4. Everything involved in my outfit matches. Don't be surprised if I had a navy hair bow in my hair earlier in that day. I ALWAYS wore matching bows, socks and a lot of the time shoes. Gotta love Keds! Yes, that is a Guess Jeans t-shirt with the sleeves rolled up. And yes, I wore bows WAY too long into my life but don't worry I won't do that to Jaylen! Oh, weren't those days so much fun. I couldn't wait to get to LCCC each summer. I know that your main focus should be on Christ but I will admit all I wanted to do was to see Gavan Byrd! I love Gavan in the picture though cause that is what some of my first memories of him are. He was such a skinny guy but so adorable at 12 years old. I will say that I'm glad I got rid of that hairstyle though cause it took WAY too long to get ready for the day. Okay, the twins are waking up from their nap so I better go but now it's your turn to post some pictures of you when you were younger so we can all laugh like you have laughed at me. I know you did. This is so funny! He looks like your younger brother! I had several diff. colors of Keds. Wow!! Gav was so little!!! I love your socks esp!! I think I had the exact same Guess t-shirt and I know that I definetly rolled the sleeves up. I wasn't in to bows, but I also wore matching socks and keds.